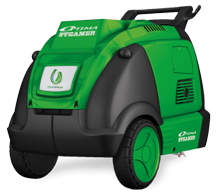 The Optima Steamer comes in three electric powered models - the Optima EST1 Steamer, the Optima EST3 and the OptimaEST3(S). Equipped with electric powered coils which produce steam in around 10 minutes, the electric Optima Steamers automatically turn on and off to maintain operating pressure. The moisture level of steam is adjustable according to the cleaning application. For example, dry steam would be used on delicate furnishings, and wet steam for heavily soiled floors. For added convenience, the 33ft-65ft (10m-20m) hoses give the operator a large range of movement. The electric powered Optima Steamers are designed to be user friendly and safe, and come with multiple safety features and an automated monitoring system. The Optima EST1 is a solely electric model and is ideal to use indoors. It can be used for a wide range of applications, including industrial kitchens, processing plants, wineries and hospitals. It provides a maximum 220V single-phase connection. Unlike the other models which are equipped with dual spray guns, the Optima EST1 comes with a single spray gun system, which still allows for full functionality. Customization and private labeling available pending minimum order quantity. The Optima EST3 is a solely electric model and is ideal for indoor cleaning applications such as industrial kitchens, processing plants, wineries and hospitals. With the Optima EST3, two operators can clean simultaneously without loss in steam pressure, as it is equipped with a dual spray gun system. The Optima EST3(S) is a solely electric model and is ideal for indoor applications, including industrial kitchens, processing plants and hospitals. This model comes with a stainless steel frame. Two operators can clean simultaneously with the Optima EST3(S) without loss in steam pressure, as it is equipped with a dual spray gun system. 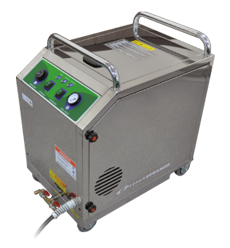 Steam Pressure (Sprayed) Depends on the distance from the gun tip, Max <212°F (<100°C) at 0"
Are you interested in receiving special offers related to cleaning products or training? If so, join our Mailing List Signup today!